EPRDF 11th Congress happening in Hawassa during a time of change in the country and could determine the fate of Ethiopia, says Abiy Ahmed. Ethiopia’s ruling coalition, Ethiopian People’s Revolutionary Democratic Front (EPRDF), is undertaking its 11th Congress in Hawassa, the seat of Southern Peoples Nations and Nationalities Regional state which is uniquely multi-ethnic compared to the rest of ethnic-based Federal states. Elected as a spokesperson of the Congress, Fekeaku Tessema, told journalists, as cited by Ethiopian Broadcasting Corporation, that 99 percent of voting members of the Congress are attending it. Of the total 2000 people in attendance, 50 percent of them are voting participants, according to a report by EBC. EPRDF 11th Congress drew participants from other countries as well. An invitation was sent to 20 political parties from different countries including the Chinese Communist Party (CCP) and parties from nine of countires are attending it. 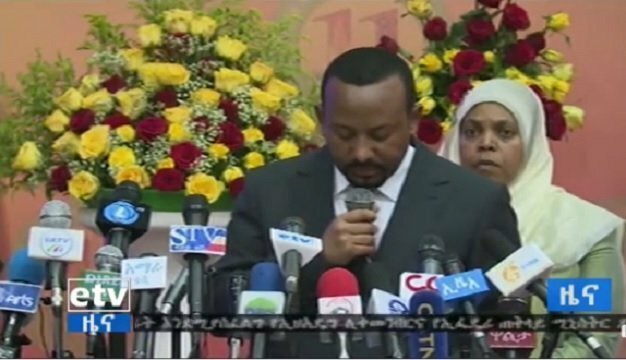 One of the things that make the Conference different from the previous 10 EPRDF Congresses, as government officials pointed out, is that opposition party members including those who were outlawed as “terrorists” before the advent of Prime Minister Abiy Ahmed’s administration are attending it. Dr. Berhanu Nega, leader of Ginbot 7 opposition movement, who was sentenced to death in absentia for an alleged “terrorist” activity, is one of those opposition leaders who attended the opening ceremony. Prime Minister Abiy Ahmed made a highly rated opening speech. “Our Congress is taking place at a time when our country and people are in an orbit of change and it will determine the fate of our country,” he told participants denoting the change and hope for a better future among the Ethiopian people, and that it must be a success. Also, noting the motto of the 11th Congress, “national Unity for multifaceted prosperity,” the prime minister emphasized a message of unity for the country. Identity need not be confused with regional administrative arrangement; he remined members of his party. The message was also ,apparently,for those who are cliaming exclusive ethnic land right causing hundreds of thousands of Ethiopia to be displanced. In addition, he felt the need to remind colleagues within the party that source of sovereign power is the Ethiopian people. Best leadership, for Abiy Ahmed (and rightly), is one that produce many more leaders capable of changing the country, and one that thinks in terms of the future of the country. Representatives of what the ruling coalition calls “partner parties”, parties that work with and under the government administering their own ethnic based federal states but with no voting right, affirmed that they will work for national unity and support the ongoing change. EPRDF claims that it is finalizing study to make these parties voting members of the ruling coalition. Member parties of the ruling coalition undertook their respective congresses in the past two weeks. Two influential parties, what are now Amhara Democratic Party (ADP) and Oromo Democratic Party (ODP), have changed name and party logo. 11th EPRDF Congress, however, will not be discussing ideology or name change, according to Fekadu. In the afternoon of the first day of the Congress, a report of what has been done since the last congress is presented to participants and they are expected to have group discussion on it tomorrow to pass important decision including electing new Chairman and Vice-Chairman for the party. There is still division within the ruling coalition regarding the ongoing reform and change. For top politicians within the party like Muferiat Kamil, who is the first women speaker of Ethiopian parliament and first women leader of coalition member party, ensuring continuity of the change and reform is not a matter of option. It is a matter of necessity. The reform leader, Abiy Ahmed, has also broader support base within and outside of the party. What seem to pose a challenge for him as much as the counter-reform forces from within, if not more, is radical Oromo ethno-nationalism which is linked to many of existing instabilities and displacement in the country in recent weeks.